A summary of what global warming of 1.5°C and higher means for Kenya. CLICK TO ENLARGE. The Paris Agreement has a goal of limiting global warming well below 2°C, ideally 1.5°C. Understanding the local-level impacts of these global temperature targets is crucial for informing climate change adaptation needs and actions. To date, mitigation pledges by nations fall far short of what is needed, with the world on track to warm by 3.2°C by the end of the century. 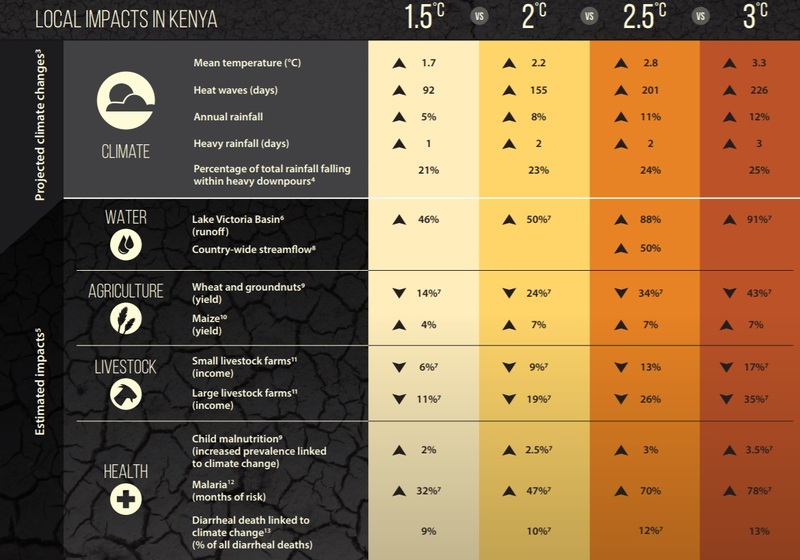 This infographic* produced by the Adaptation at Scale in Semi-Arid Regions (ASSAR) project sumarises the impacts of warming scenarios from 1.5-3°C in Kenya. *Access the full infographic from the right-hand column. The methodology behind this analysis can be found in the ASSAR working paper: Determining what global warming of 1.5°C and higher means for the semi-arid regions of Botswana, Namibia, Ghana, Mali, Kenya and Ethiopia: A description of ASSAR’s methods of analysis. For Kenya, local warming will be greater than the global average, with significant impacts for the already-warm climate. Even a 1.5°C increase in global temperature will severely affect agriculture, health, and other vulnerable sectors. Under an increasing emissions trajectory, the 1.5°C threshold could be breached within the next decade, and the 2°C threshold the decade after. As impacts on climate extremes and vulnerable sectors will worsen with each half degree increment, and compromise Kenya’s development agenda, there is an urgent need to accelerate the country’s adaptation responses.